How to stay warm in a tent? →How to stay warm in a tent? Tents are usually cold and lonely places. If you are not layered enough you might end up spending your whole night in the cold. In case you are a frequent camper knowing how to stay warm in a tent is an extremely important skill to have. Instead of subjecting yourself to some cold uncomfortable nights follow the below-mentioned tips to enjoy your vacation and stay warm in a tent. First and foremost it is important that you plan your trip in advance whether it is for hunting or adventure. Stock up on all the supplies to avoid any trouble later on. The following points need to be kept in mind while retiring for the night. Take off all your clothes and wear all dry and fresh clothes. Our body keeps secreting sweat and that attracts the cold air towards you. Make sure you have kept your dry clothes in a waterproof bag in the day and avoid cotton clothes as they tend to cool your body quickly. Prefer to wear woolen clothes but they should also be chosen smartly. Avoid bulky items and instead wear woolens which are easy to peel off and comfortable. Your sleeping bag should be layered appropriately to not let the warmth leave your side. Place blankets, towels rugs, mats and any extra clothing above or near your sleeping bag. To avoid the cold from seeping from the ground you can buy insulated sleeping mats which can be placed right below your sleeping bag. Try to heat some water and put them in plastic bottles. These can then be placed near and around your sleeping bag to provide you warmth. In the morning you can use this water for other purposes like drinking and washing. Condensation can be a major hassle and cause your sleeping bag and other objects to drip in the morning. The main reason for condensation is your breath which exudes nearly 1 liter of vapor in a night. Here is how you can limit the condensation happening in your tent. 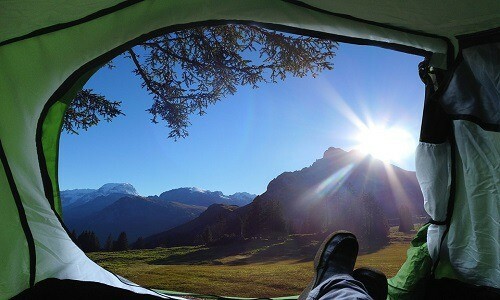 The easiest way to reduce condensation is to leave the rain fly of your tent open. This would allow maximum ventilation and all the water vapor accumulated would escape from the outlets. Make sure that your tent is not pitched very close to any water outlet like lakes, rivers, dams or any other water sources. Due to humidity, you will find that the amount of condensation is more hence stay away. Keep your wet or even moderately damp clothes out of the tent. Wet clothes attract more water vapor and increase the condensation. If you cannot do so then place them in dry bags and then only bring inside. Condensation will happen come what may. The maximum you can do is to reduce its amount by following the above tips. Keep a towel handy to keep wiping the water droplets formed. 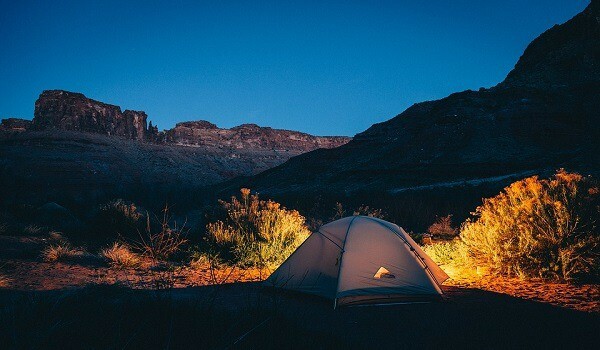 Camping with your air mattress can be fun provided you know how to keep it warm.Check this post for air mattress guide. If that does not happen you might have to spend some sleepless nights shivering in the cold which is not very enjoyable. Here are some tips that can help you. Place a foam mat underneath your air mattress. This would stop any heat from your body to leave the sleeping bag and go elsewhere. You can also use a woolen underlay or some blankets to maintain the heat level. You can use a hot water bottle and place it near your air mattress. 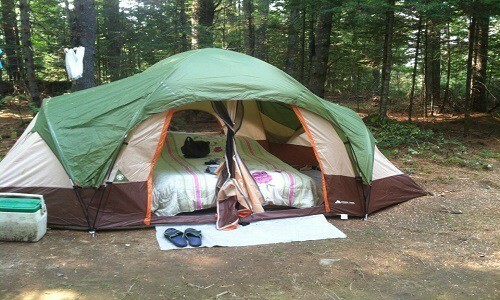 Also, ensure that the air mattress is kept far away from the sides of the tent. With time condensation happens on the tent and if your mattress is placed close to it chances are it might trap in the cold. In case you are able to purchase an insulator mat then you can keep the same below your air mattress. The cold ground would then be unable to withdraw the warmth of your body and you can sleep peacefully. Camping can be fun provided you know how to enjoy it to the maximum. Don’t let a small inconvenience like cold weather spoil your entire trip. Follow the above tips to keep yourself warm and relaxed. It would take you some time to understand which tip works for you best and once that happens you would face no discomfort whatsoever.